Pure, by Andrew Miller, is a novel about the demolition of a cemetery in pre-revolutionary Paris, and it would be hard to think of a much more gothic premise for a book. The cemetery is les Innocents, a place filled to overflowing with the remains of countless generations of Parisians, rich and poor. Les Innocents has been closed to new interments but retains its priest, an organist and a verger. However, it has become an offense and health hazard to the surrounding area. The Minister commissions a young engineer from the country, Jean-Baptiste Baratte, to undertake the demolition of the cemetery and its buildings, and Pure is the story of the subsequent events. Baratte becomes familiar with Paris, enlists the assistance of a variety of unlikely helpers, encounters opposition and battles to complete his work. Andrew Miller is a well-established author of literary fiction, often set in an historical setting, so in Pure he returns to territory with which he is familiar. The story is based on a true event, but the described details are fictional. The setting is macabre – Paris is filled with smells and dirt, with squalor described in detail, at times enveloped in a dense mist. Many of the characters are grotesque and deformed, physically in some cases and psychologically or morally in others. There is a strong sense of a regimen coming to its end; a team of 18th century graffiti writers begin to use Baratte’s nickname in the crude political slogans which they write all over Paris. Baratte receives his initial instructions in the Palace of Versailles, and when he returns at the end of the novel with his report he finds the Palace largely deserted and a sense of decay everywhere. 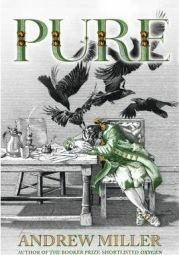 As a story and entertainment, Pure is a well written and engrossing book. The characters and events are interesting, the story was a new one to me, and the outcome is always uncertain. The quality of the writing is always high – there is an impression of sentences carefully considered, with few words wasted. At a deeper level, it is an essentially optimistic book about the potential for reason to triumph over superstition, though of course it is considerably more complex than that. At the beginning, Miller quotes the Marquis de Condorcet – “The time will come when the sun will only shine on free men who have no master but their reason”. One of the key symbolic events of the book is when the masons first break through the roof of the Church on the site of the cemetery – a shaft of light bursts through to the chancel and reveals the dirt and decay which was previously hidden. There are, however, many other symbolic moments scattered through this excellent novel, one which should appeal to readers both of historical and literary fiction.